Hazardous Location (HazLoc) Duty Vortex A/C Coolers are designed specifically for purged* Electrical enclosures in Class I Div 2, Groups A,B,C and D locations, Class II Div 2, Groups F&G and Class III locations. The HazLoc Vortex A/C incorporates the most up-to-date features into Vortec’s line of highly reliable, cost effective enclosure coolers. The HazLoc Vortex A/C is available in 4 different cooling capacities. All of Vortec’s Enclosure Coolers keep Electrical and Electronic Enclosures cool, clean and protected and are a low cost alternative to expensive, high maintenance air conditioners; and avoid contamination with dirty, humid air caused by fans. Today’s small, compact multi-function electronic controls, variable speed drives, servos and programmable logic controllers are extremely sensitive to heat and contamination. Smaller cabinet sizes make temperature control difficult and prone to premature failures. Excessive heat will cause digital displays to misread, controls to drift, and breakers to trip below rated loads. The result is productivity lost due to machine or line shutdowns. 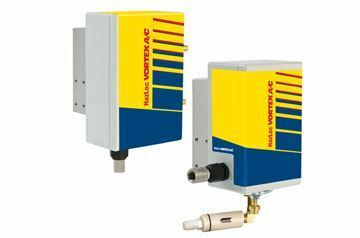 HazLoc Vortex A/Cs maintain a slight pressurization on the cabinet to keep electrical and electronic components clean and dry; and most are thermostatically controlled to maintain enclosure temperatures within a specified temperature range. * Class I Div 2, Class II Div 2 Groups F&G, Class III and Groups A,B,C and D locations.